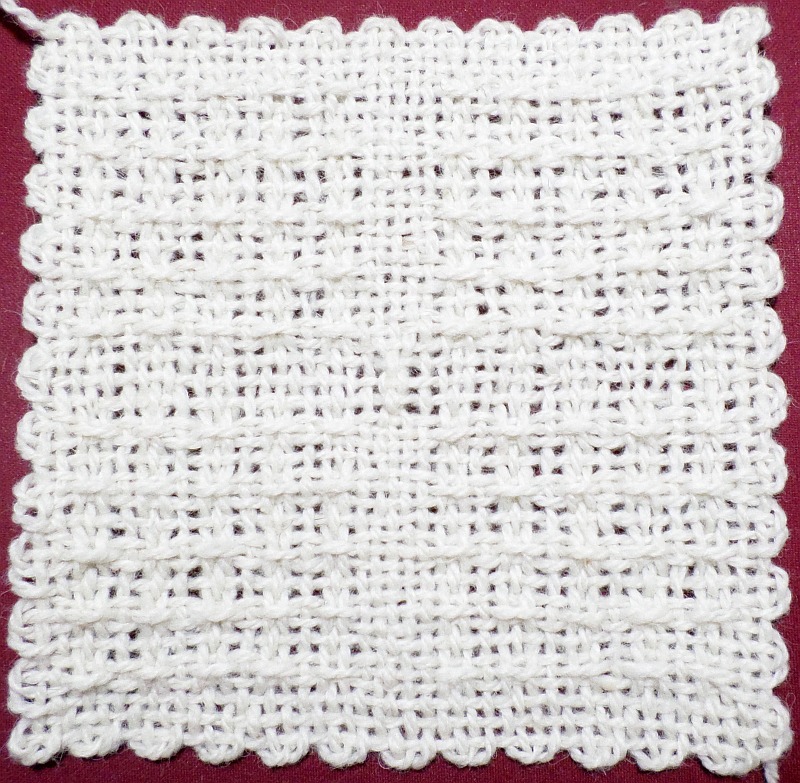 The X Stitch is generally located in the very center of the square, but it can be placed anywhere. 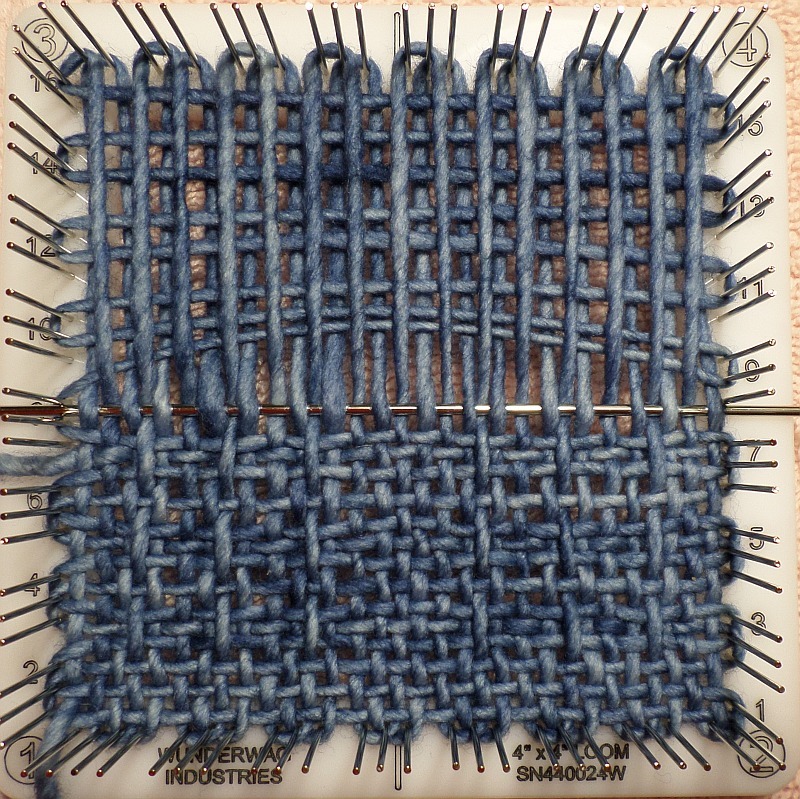 It can be used on any size loom, in almost any pattern, with varied frequency; e.g. the square pictured above could have had three Xs across the horizontal center row. 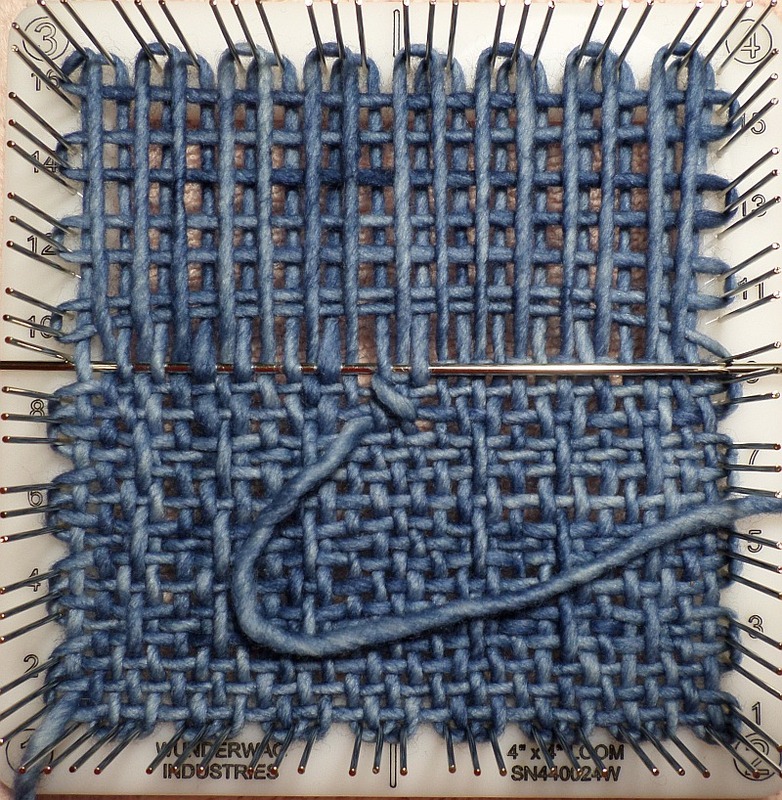 X Stitch is an interesting way to divide the top and bottom, or side to side, halves of the loom without merely leaving plain weave rows or sections. 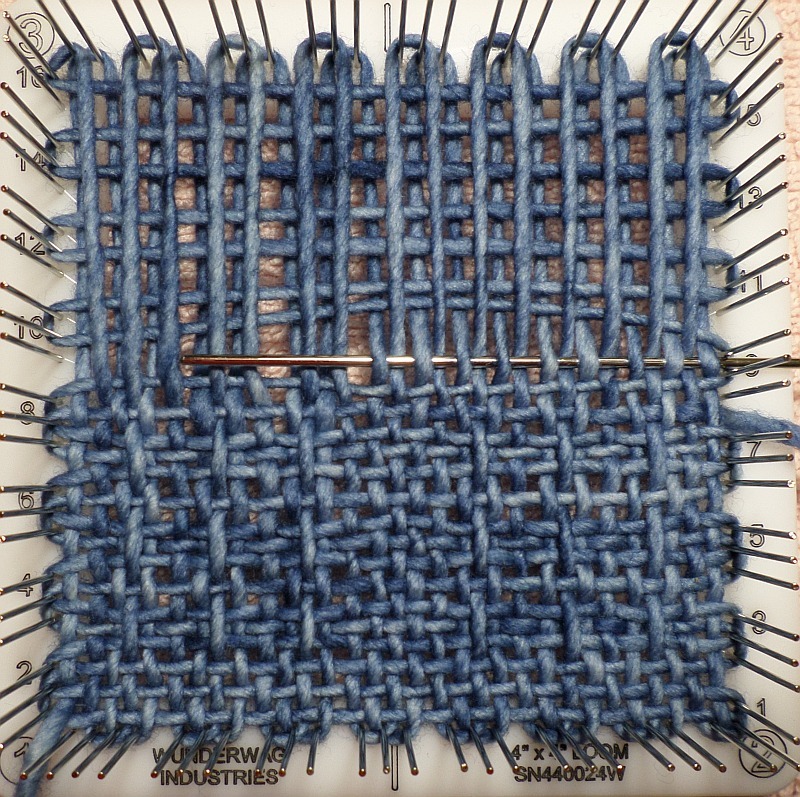 However, plain weave rows are also an option. 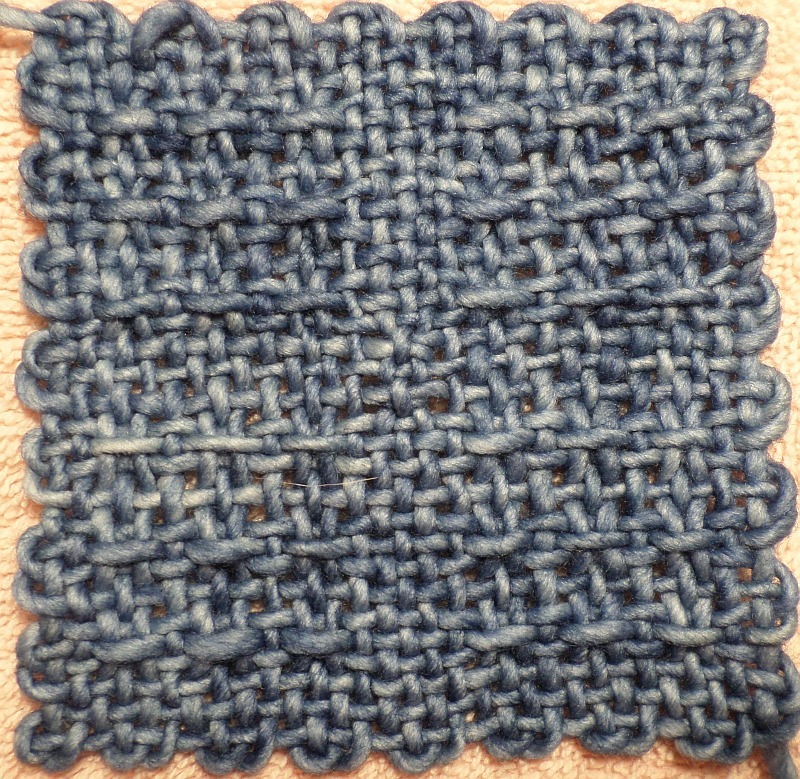 The X Stitch in this demo is worked over three rows. This means that in the three-layer style, it catches the L4 row you’re working, the L2 row below it and the L4 row below that. 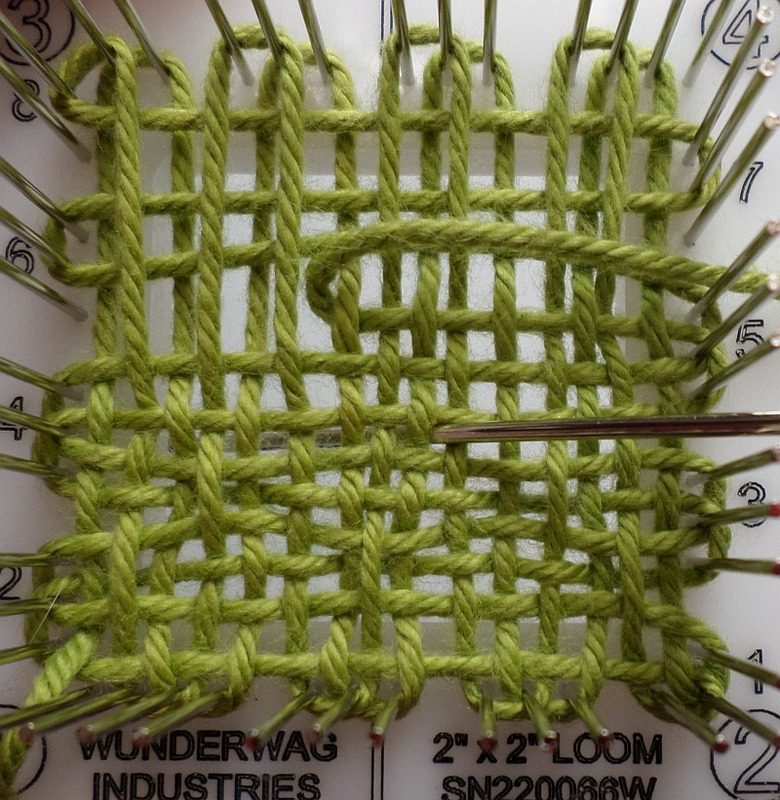 On a 2″ loom—Rows 5, 4A, and 4 (4A=the L2 row between 4 and 5). 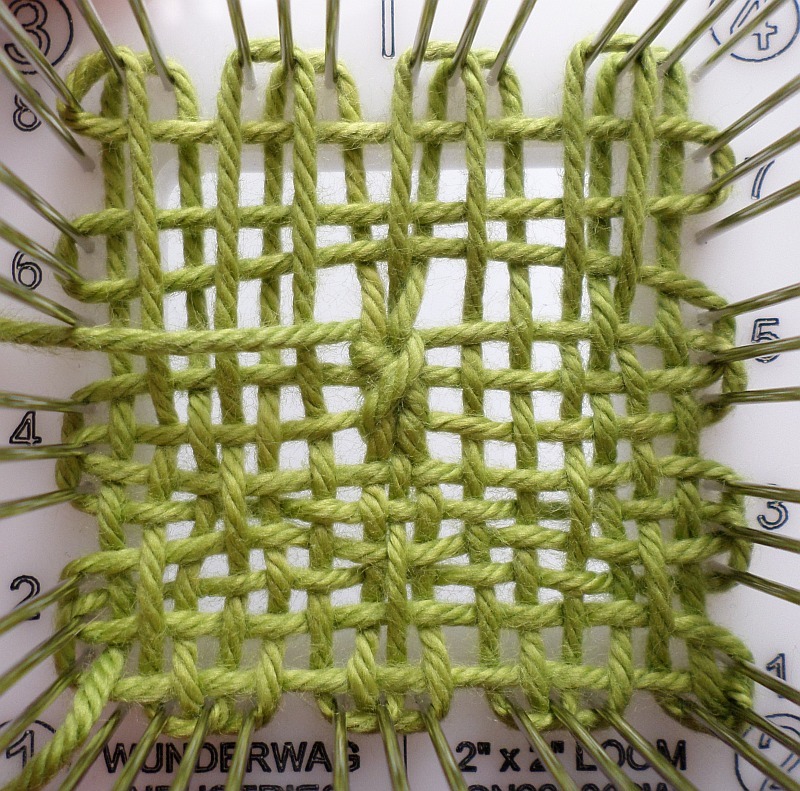 On a 4″ loom—Rows 9, 8A, and 8. 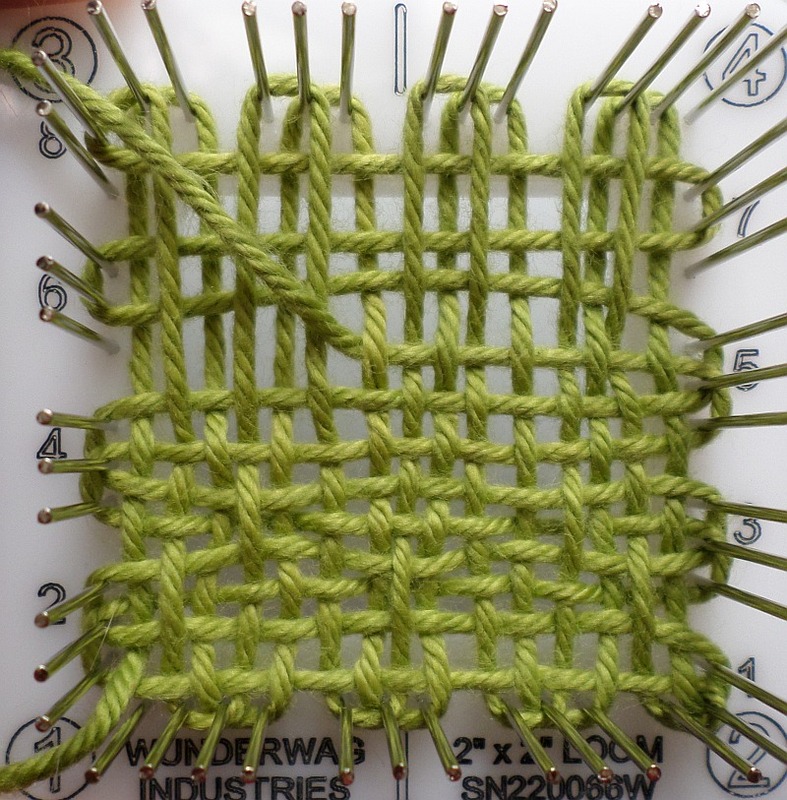 On a 6″ loom—Rows 13, 12A, and 12. 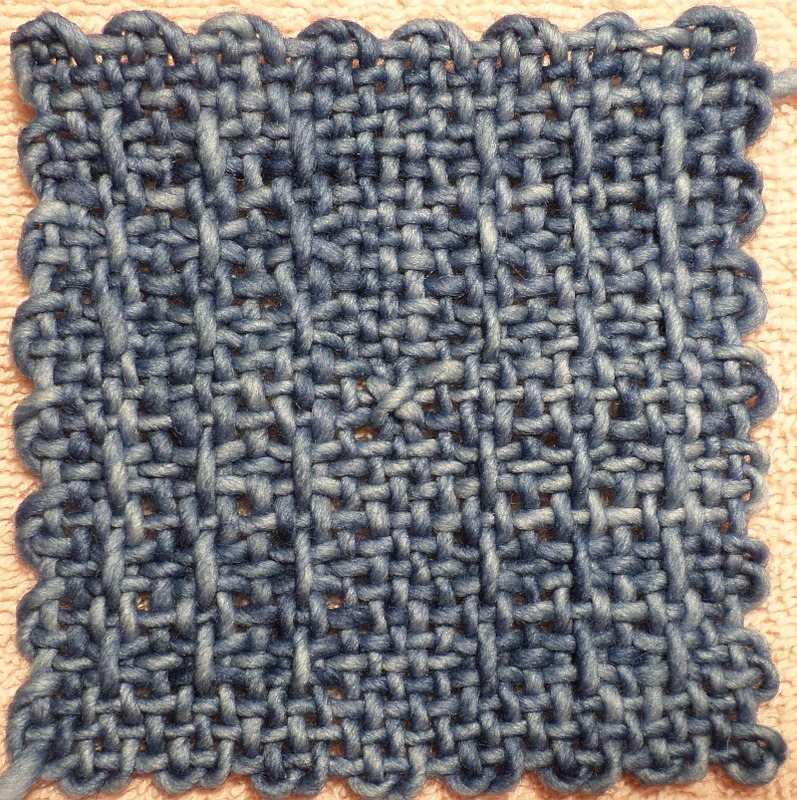 Work the lower row of the X Stitch with plain weave (P). 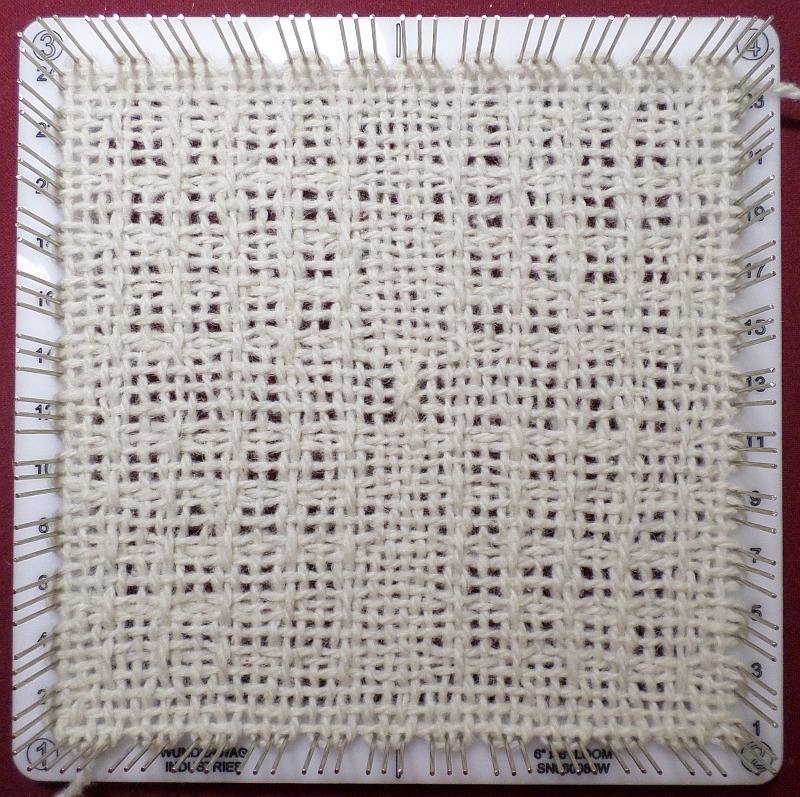 On the 2″ loom—R4; 4″—R8; 6″—R12. 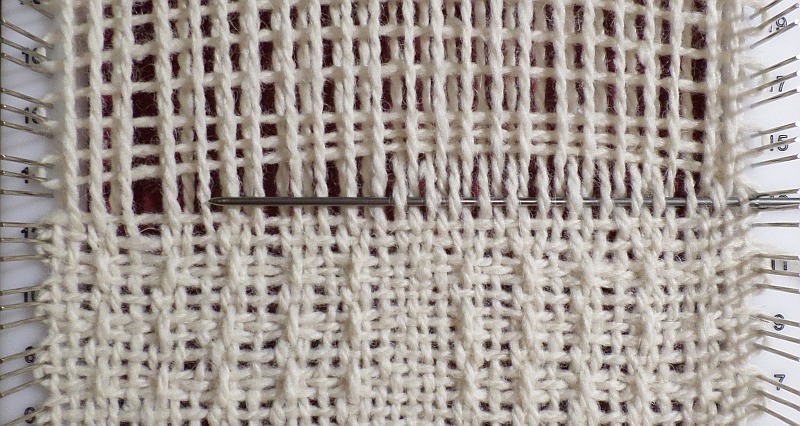 Begin the second row of the X Stitch by plain weaving to the center warp plus one strand. 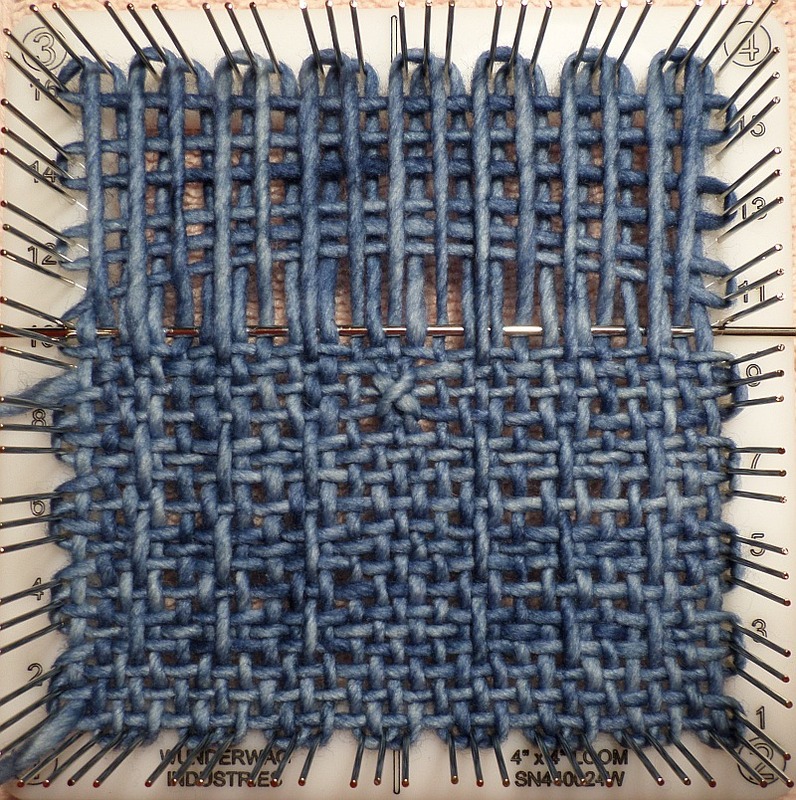 (Some people go U3 at this point, but I think it looks better on the back to plain weave the stitches; see Other Options below.) 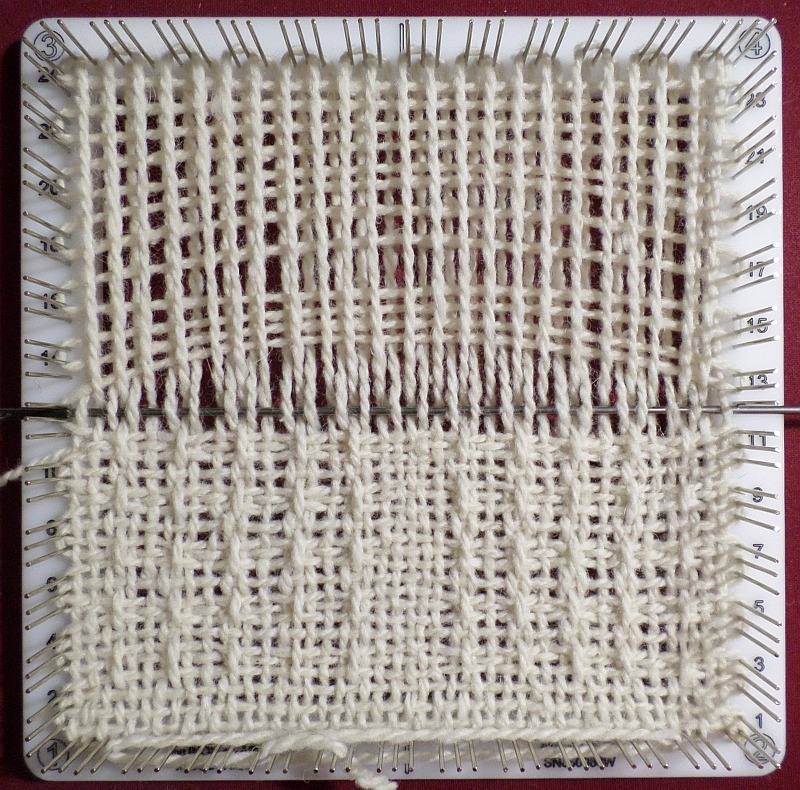 On a 2″ loom—P9; 4″—P17; 6″—P25. Pull the needle through as though you were at the end of the row. This is Point 1. Yarn is poking out at Point 1 after needle was pulled through. 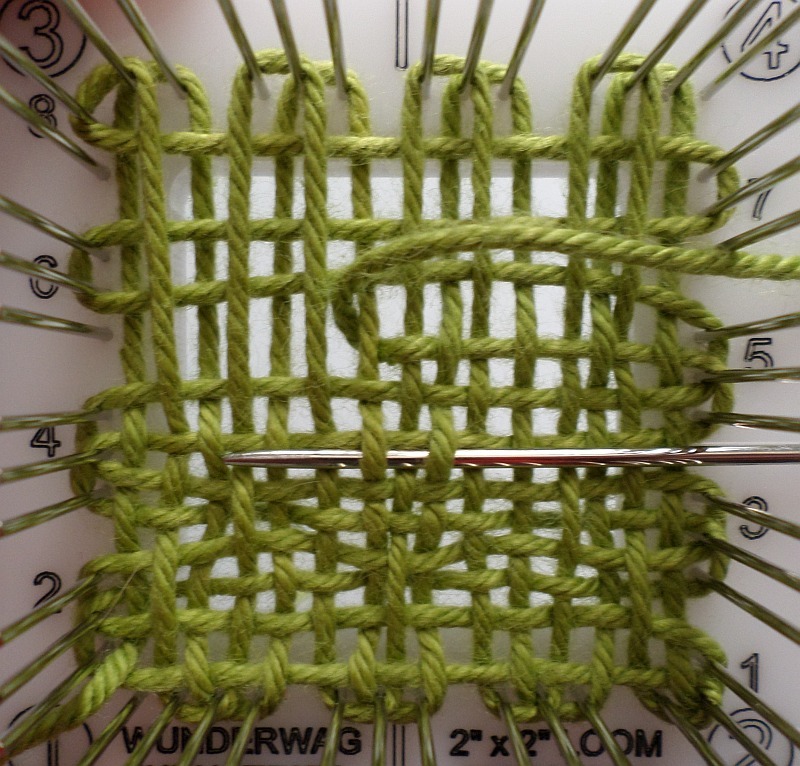 From Point 1, take the needle back over 3 sts and down 3 rows (count the one you’re working on as one of the three rows) and insert it at Point 2. 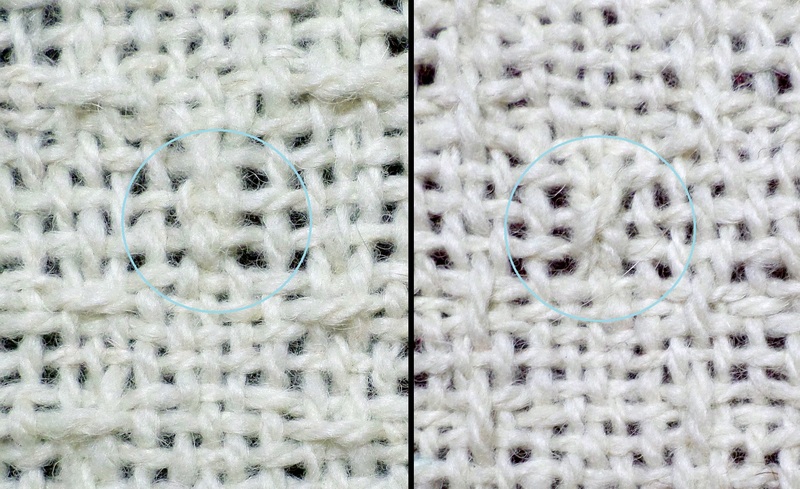 Left photo shows Step 6 with cross thread loosely in place. From Point 3, take the needle back over 3 and up 3; insert the needle at Point 4 above the L4 you started previously. P3 above the final three stitches of that row. From Point 3, take needle to Point 4; P3 above previously begun row. 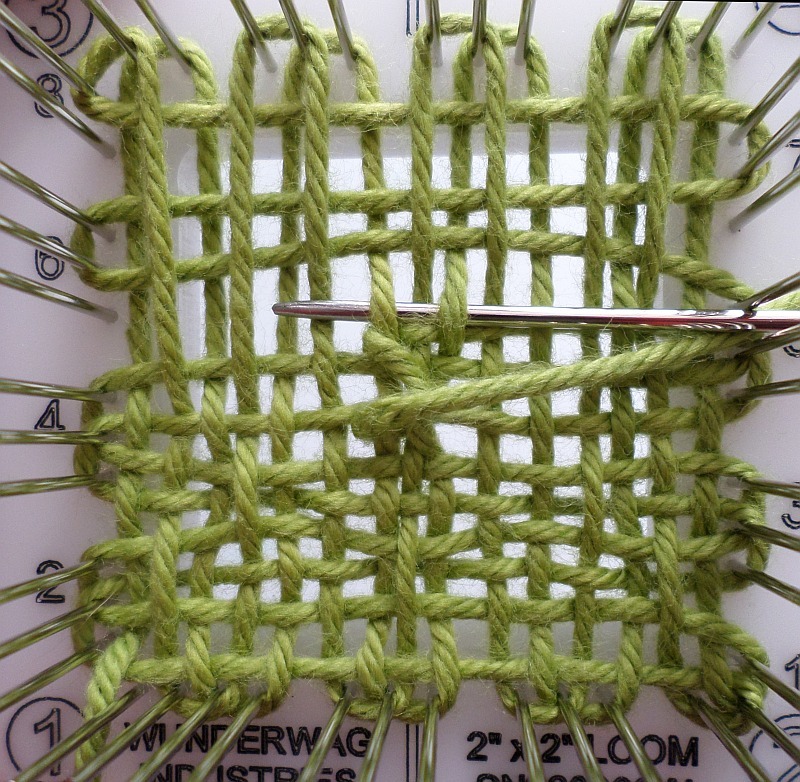 Pull the needle through to tighten the X and P the remaining sts of that row. 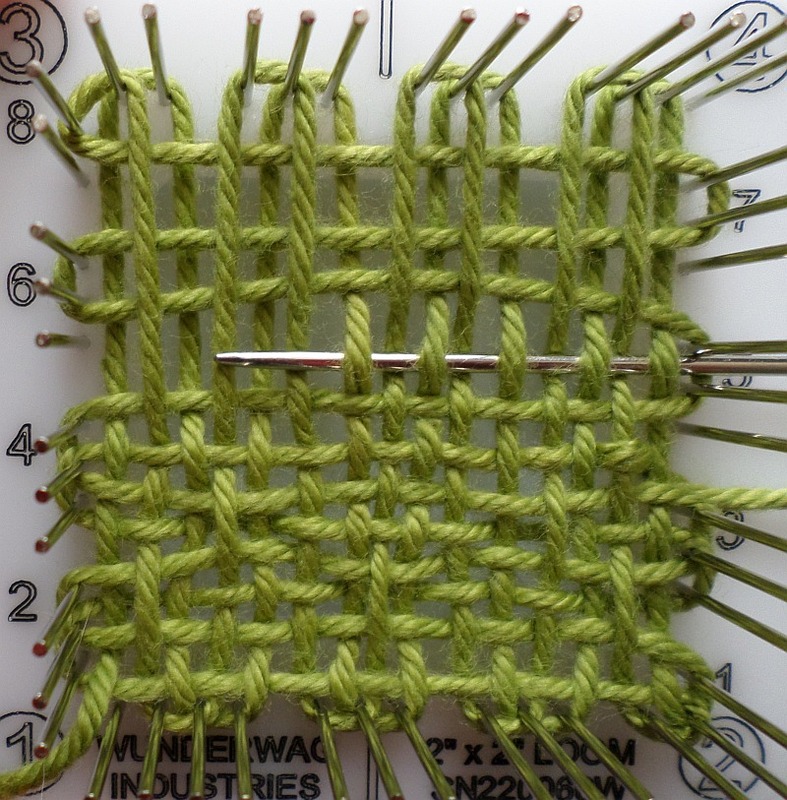 Continue on to the next row, following whichever pattern weave you’re using. 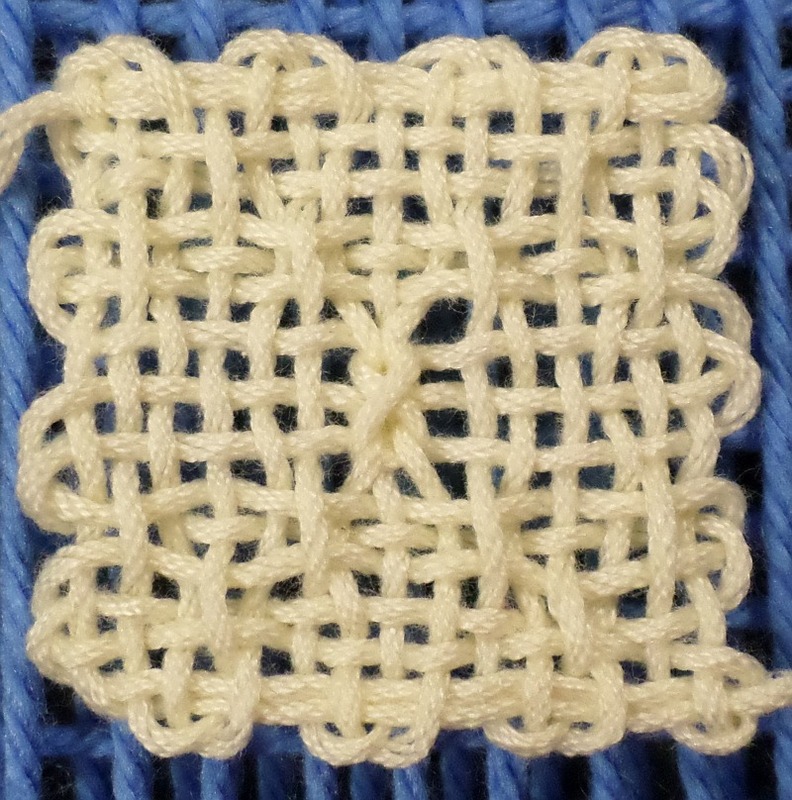 This is the way the X Stitch looks on the back. 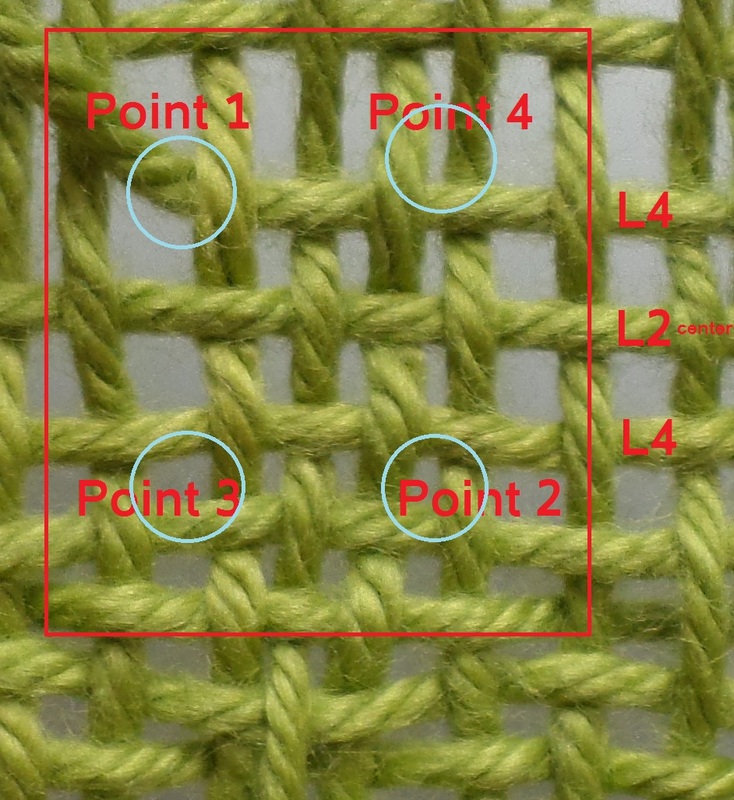 You can also make the X Stitch by going U3 from Point 4 to Point 1 and again from Point 2 to Point 3, but I don’t think it looks as good on the back or the front. 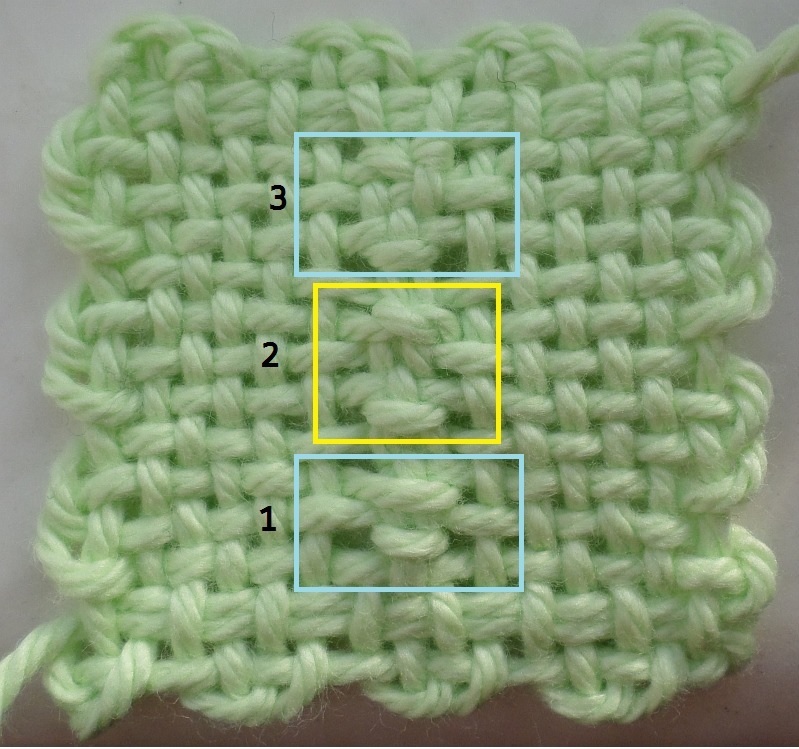 It’s also necessary to choose a method of anchoring the top U3 stitch amongst the warps. If you’re participating in the Shawl Weave-Along (Jan 2018) on the Facebook Pin Loom Weaving Support Group, you’ll be using the 6″ loom. R13: P25, perform X Stitch, P remaining sts. 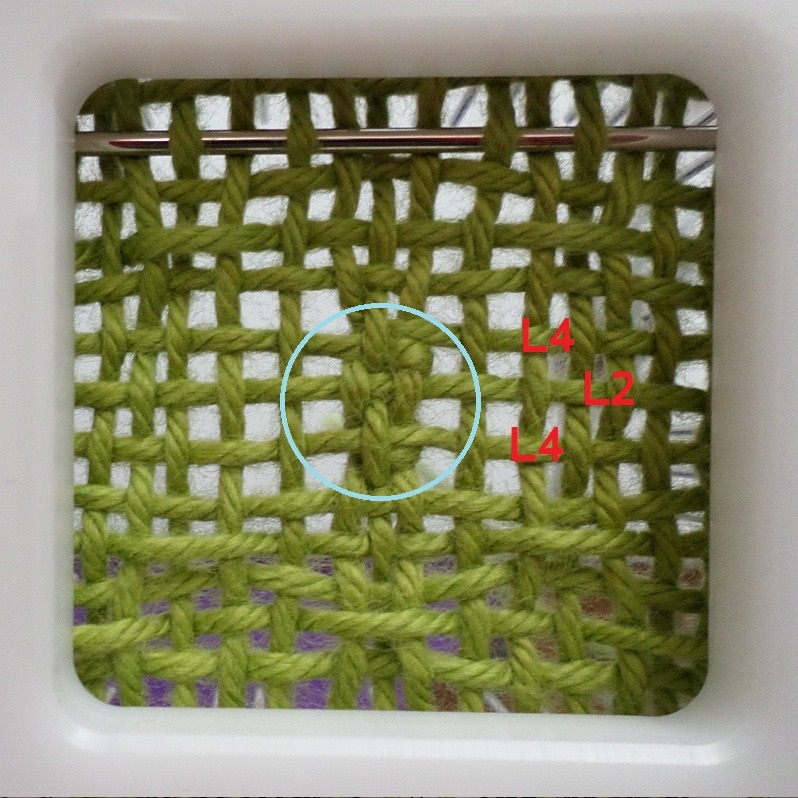 Gently tighten the first half of the X; insert needle at Point 4; P3 above last three stitches completed on R13 and complete plain weave across. To tighten the X see illustration below. 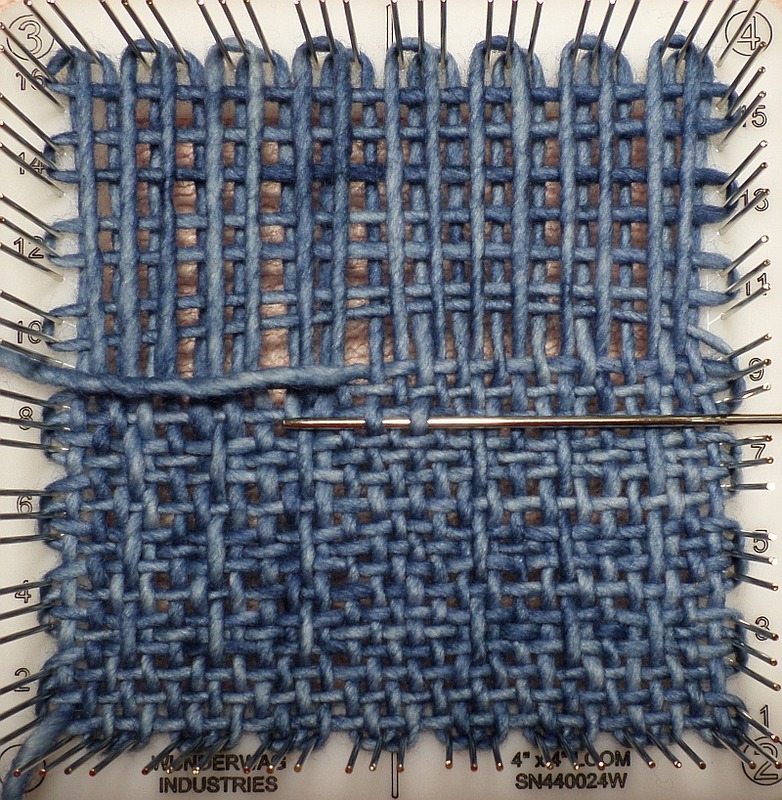 Insert needle at Point 4; P3 above last three sts of R9 and plain weave on across the row; gently tighten the second half of the X Stitch. You may or may not have noticed, there’s a mistake in R16 on the 4″ square. I’ll be demonstrating how to fix that in another post. 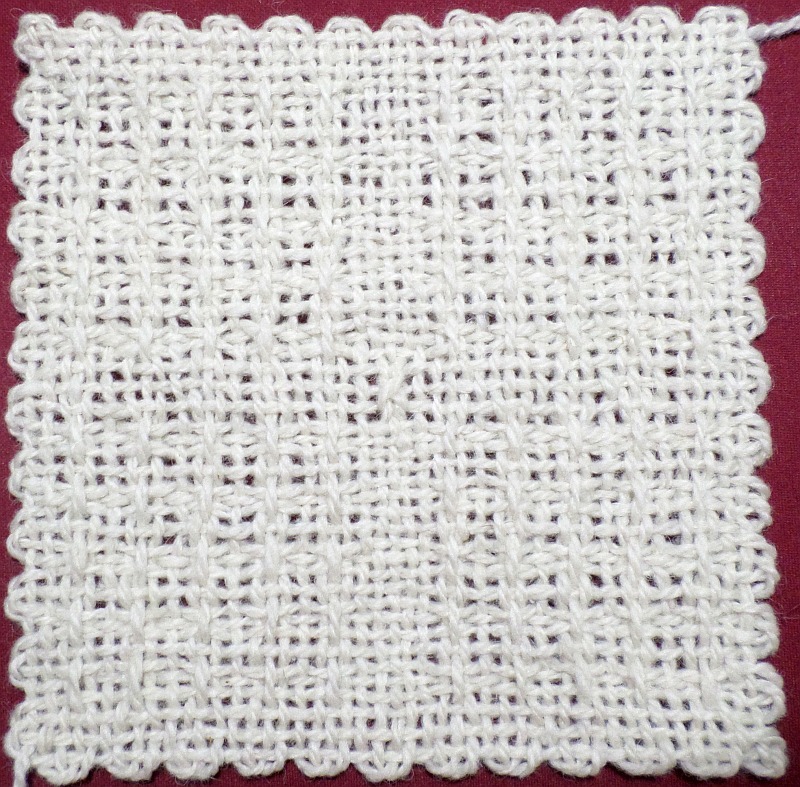 Also, please notice that the pattern weave of the 4″ square is less outstanding because of the yarn’s mottled appearance. 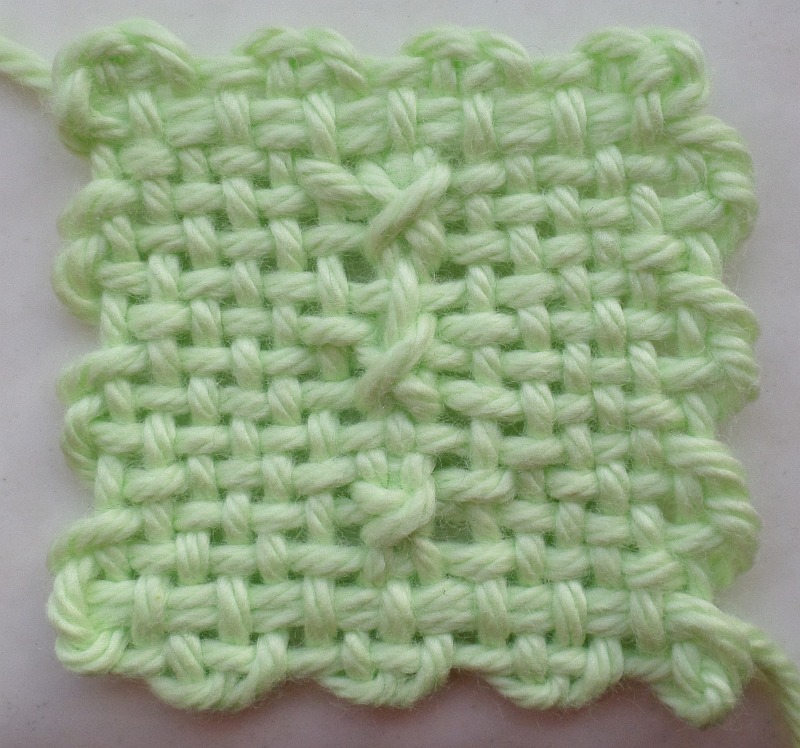 In general, I recommend solid colored yarn for pattern weaves.